↑ Ganapathy, Lata (December 12, 2012). 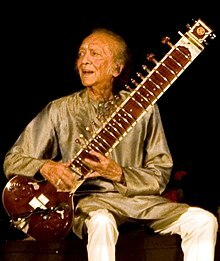 "Pandit Ravi Shankar passes away". The Hindu. Retrieved December 12, 2012. ↑ Hunt, Ken. "Ravi Shankar – Biography". AllMusic. Retrieved 15 July 2009. ↑ "SNA: List of Akademi Awardees – Instrumental – Sitar". Sangeet Natak Akademi. Retrieved 29 July 2010. ↑ "Padma Awards". Ministry of Communications and Information Technology. Retrieved 16 July 2009. "East Meets West Music". Ravi Shankar Foundation.